The MS35Cart for Leon edit new slide showK PRO is a 24/7 continuous recording trouble-shooting monitoring station. Featuring built in high power LED lighting, and software control for up to 8 high speed cameras. 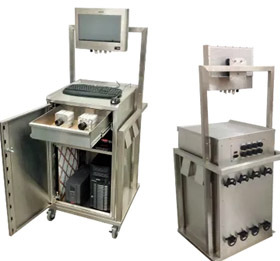 The MS35K PRO Cart is a purpose build stainless steel mobile platform featuring a lower shelf for the UPS power & DVR server, a middle storage shelf, a convenient upper pull out drawer, locking front door, vibration and shock absorbing cart design, and locking swivel castors.